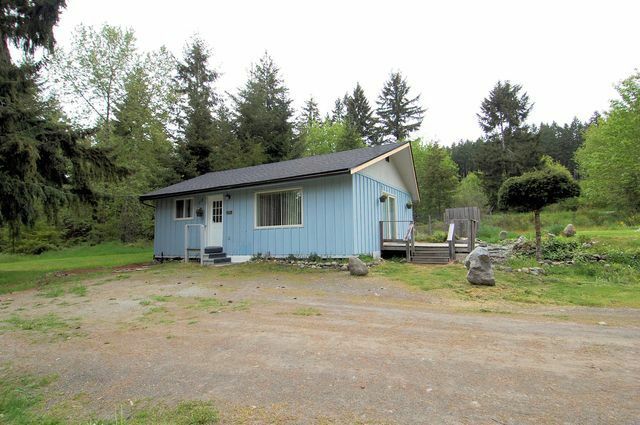 Move in ready 2 bedroom starter home on 4.14 acres just minutes from Duncan's amenities. You'll be surprised at how roomy the smartly laid out 785 square foot space feels. This flexible acreage with A-2 zoning allows a second larger home to be built elsewhere on the property while maintaining the current home for rental income or extended family. Recent updates include a new roof, fresh paint throughout, a 2 year old hot water tank, a brand new drilled well with 1950 gallon cistern and top of the line treatment system to ensure great water is not an issue. Some extra features include a 10' x 16' deck off of the dining room, fenced garden area, and 8' x 12' garden/storage shed. The original Hillcrest Lumber mill occupied part of this property many years ago and a little piece of history is retained here. The property is private, level, and offers a mixture of clearings, trees and bush, which is terrific for bird watching. Versatile acreage close to town...don't miss this opportunity to call it your own! Call Mike today for your showing!